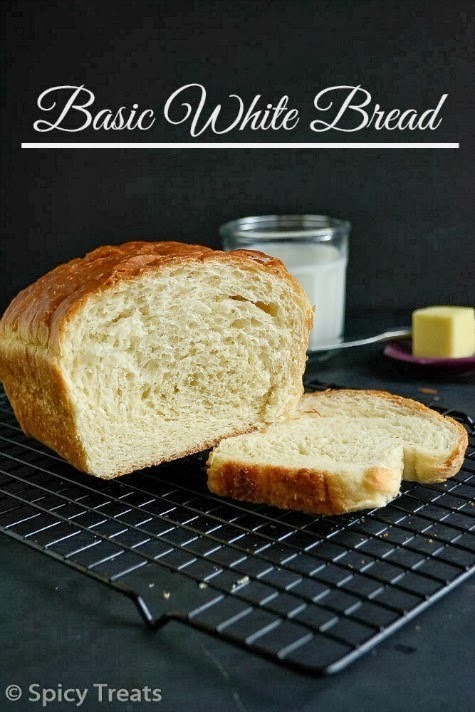 Its my long time wish to bake a White Bread since we completely stopped store bought breads i wanted to bake a fresh loaf for my kids. 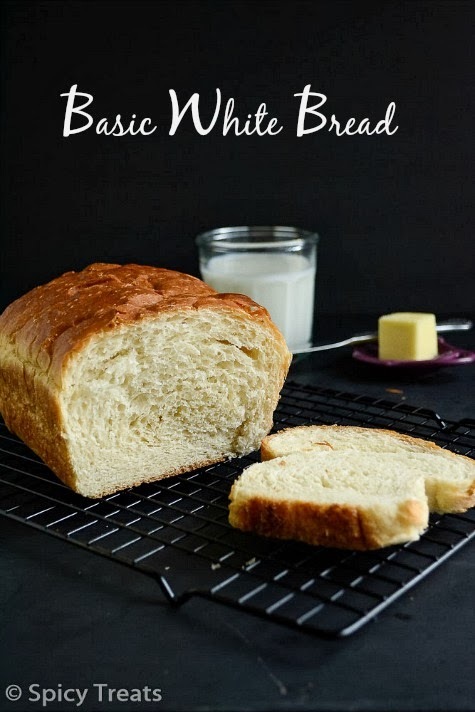 After My 100% Whole Wheat Sandwich Bread baking i was so much tempted to try a White bread from the scratch. So after getting a new stand mixer this year this was the first recipe i tried and the result was awesome. The bread turned so perfect, soft and delicious than my expectation. 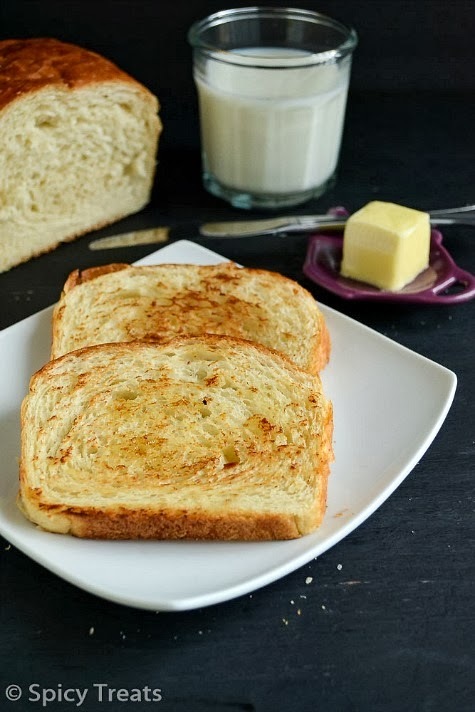 I made a simple bread toast with butter and the toast was so yumm and flavorful. My kids loved the bread so much and the two loaves vanished in just two days. This time the stand mixer did the kneading job so well in just 4 minutes and i was so so excited to see the soft, smooth, elastic dough in just 4 minutes. I am really enjoy kneading with my Stand mixer. 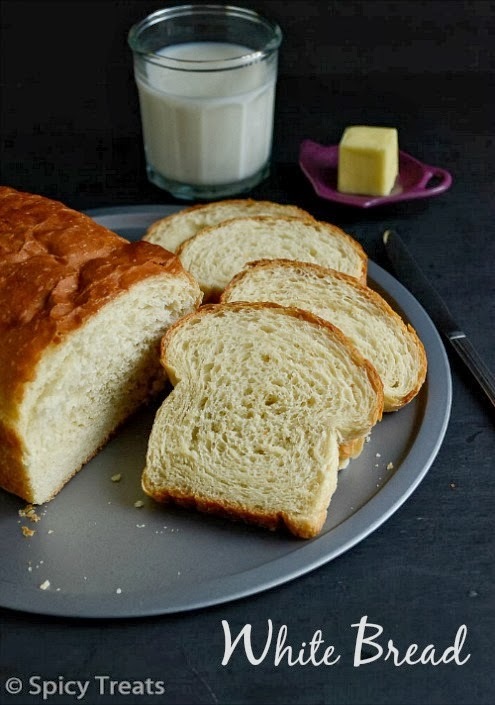 But this bread recipe is so simple and it can be done by hand kneading too. The recipe is from the KitchenAid Stand Mixer recipe Book. Place Milk, sugar and butter in a small saucepan. Heat over low heat until butter melts and sugar dissolves. Cool to lukewarm. Dissolve Yeast in warm water(if using highly active yeast, skip this step and directly mix the yeast with flour) in the mixer bowl. To this add lukewarm milk-butter mixture and 4 1/2 cups flour & salt. Knead the dough for another 1-2 minutes in mixer( 7-8 minutes by hand)or until dough is smooth and elastic. Dough will be slightly sticky to the touch. Place dough in greased bowl, turning to grease top. Once done, punch down and divide the dough in half. On lightly floured surface, roll each half into a rectangle, approximately 9x14". Starting at a short end, roll dough tightly. Pinch dough to seal seam. Grease a 9 x 5 loaf pan and Place the loaf seam side down in it and allow to rise again. Repeat for the other piece of dough. Let rise in warm place, about 1 hour or until doubled in bulk. Bake at 400 degree Fahrenheit for 30 minutes or until golden brown or the bread sounds hollow when tapped. Remove from pans immediately and cool on wire racks. After cooling for an hour slice it. If using instant yeast/highly active yeast just mix it with flour and salt and combine. To this add milk-butter mixture, water and proceed kneading. After placing the shaped dough in loaf pan cover it with greased plastic wrap(just grease the plastic wrap with butter and cover the pan). Use a sharp serrated knife to slice the bread for even and neat slices, i don't have a sharp knife so mine look bit crumbly and not even. the bread pictures were taken the second day. wow !! well made Sangeetha..Perfect they look. 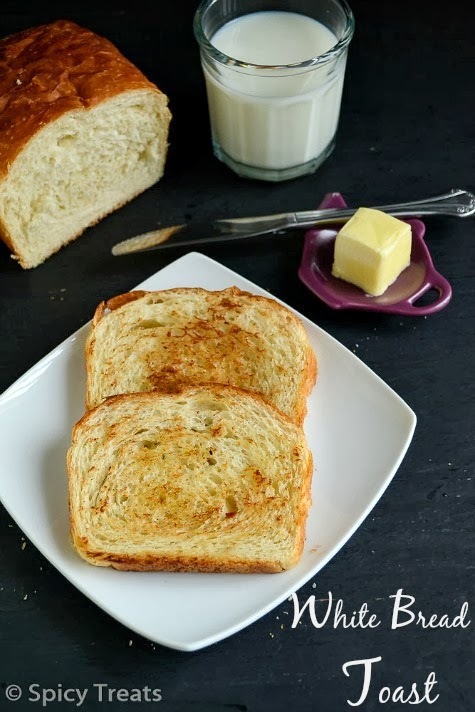 Of course we get white bread everywhere but home made is homemade n nothing can beat it..
very soft and very fluffy!!! 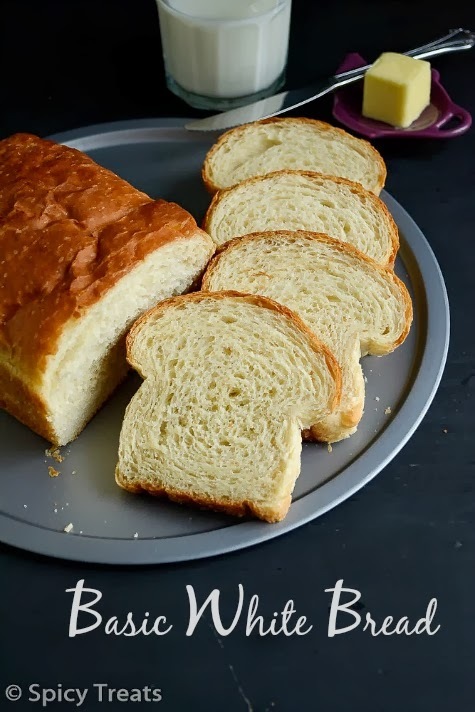 Wow...so soft, moist and delicious bread. I was thinking to make the bread, when I just saw the recipe. Your looks so tempting. Love the slices,which was perfectly cut. 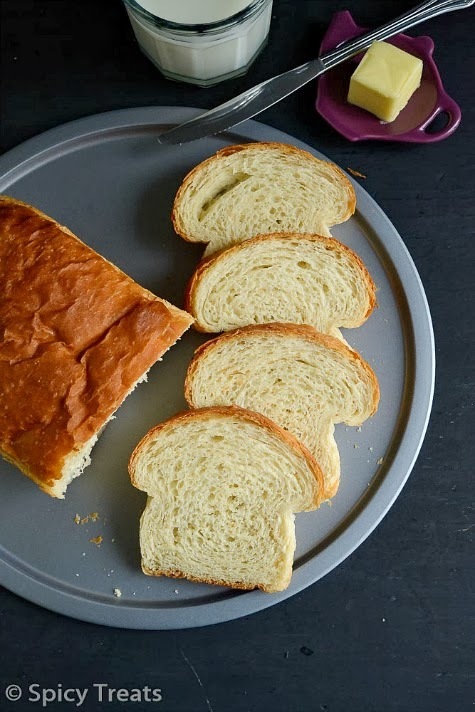 Soft and delicious looking bread. Excellent preparation. 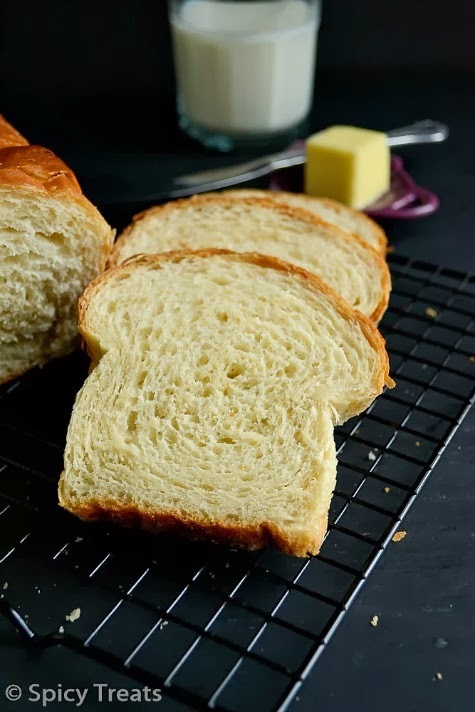 Delicious, moist and soft bread..........looks so perfect, just like store-bought. Hi, I just made this recipe and realized after I stepped through the recipe, you didn't add the salt in the instructions. It's in the NOTES, but not in the steps. I am very sorry. Yes.,i missed it in the method/instruction..now i updated it. The loaves look perfect Sangeetha..
Can I half the ingredients to make one loaf bread. Please tell me. Yes you can half the recipe for one loaf bread! Thank you for the quick reply...your blog inspired me . I will try small loaf and will tell you. Thanks again. Do share your feedback. Keep trying and feel free to share your feedback and suggestions. kids. The conventional age for children to ride the gas/electric scooters is 8 years.